W.B. 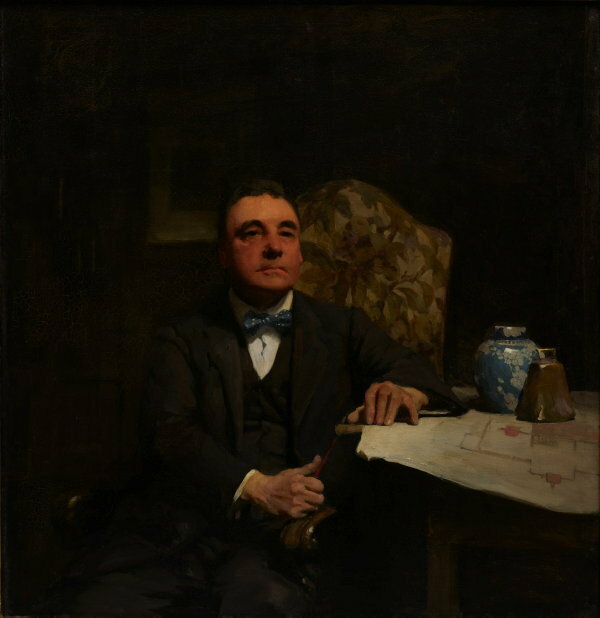 McInnes' portrait of Desbrowe Annear (1865–1933) is significant as winner of the first Archibald Prize in 1921. Winning the prize six more times for his characteristically dark, tonal portraits, McInnes was the pre-eminent artist of the Prize's first decade, and, with John Longstaff, virtually dominated official portraiture. Desbrowe Annear was a well-known Melbourne architect. Primarily a designer of houses, his best known are 32, 34 and 38 The Eyrie, Eaglemont, constructed between 1902 and 1903. Working in a variety of modern styles, Annear sought to create an architecture suited to the climate and geography of Australia. This work was aquired by the Gallery in 1922.